There are many business scenarios where SharePoint list items need to be created based on Daily, Monthly, Yearly basis or based on specific dates. This is used for cases like recurring maintenance tasks for Assets, renewing Contracts etc. 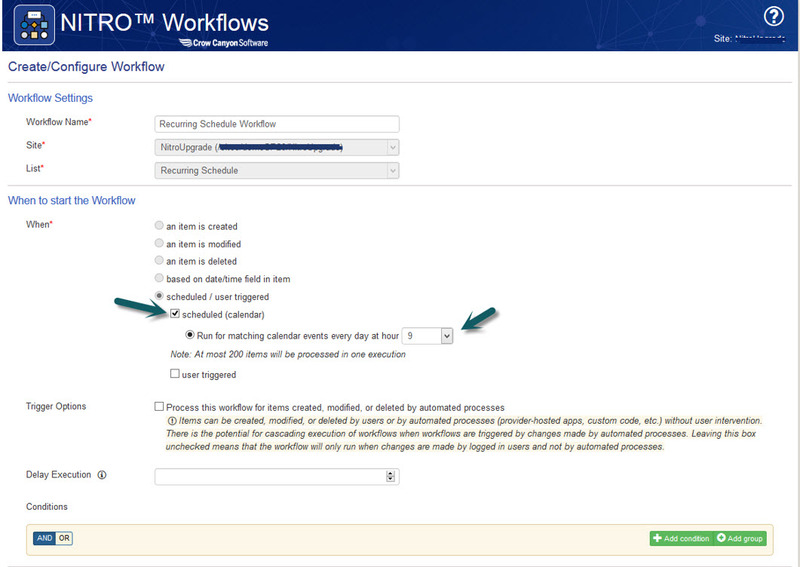 This functionality can be configured using Crow Canyon NITRO Workflows App. 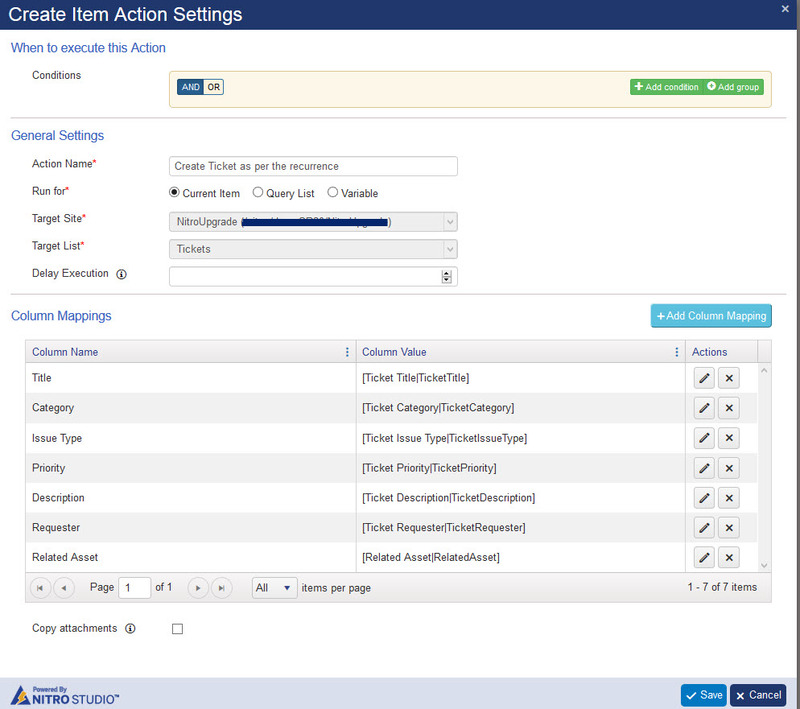 In this article, we have taken Tickets list as an example but this can be configured on any list using the Workflow Manager. We will create a recurring schedule list (Calendar list) and then configure a Scheduled workflow to get the recurring items created in the Tickets list. You can use the standard calendar feature to set the date of occurrence. This could be a one time occurrence or a recurring schedule. 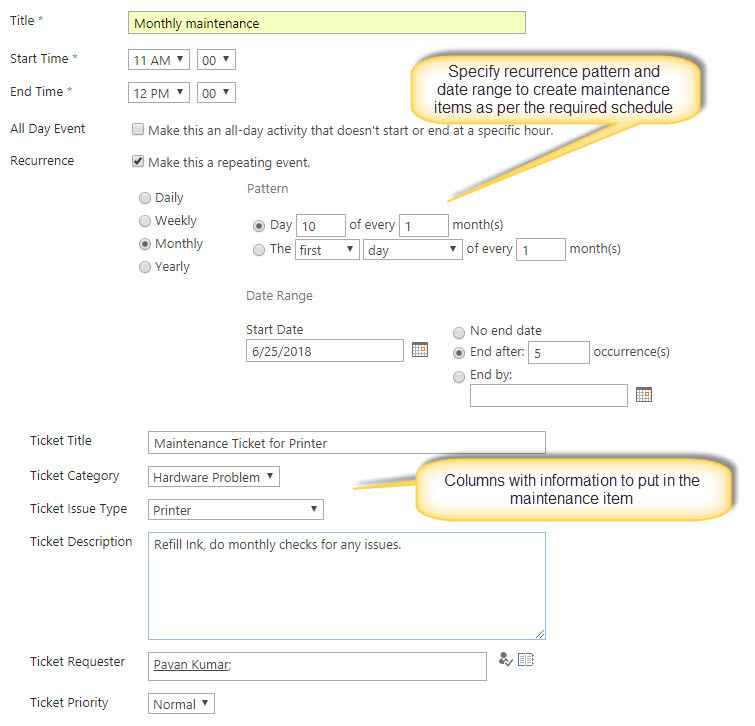 For example, if maintenance Ticket has to be created every month then enable the recurrence in the calendar item and set the schedule including end date or number of occurrences etc. While creating the maintenance Ticket, we need to put the required information in the Ticket. We will create additional columns in the Calendar list to hold this information and this is copied to the Ticket at the time of Ticket creation. Create a Calendar type list with name “Recurrence Schedule” (you can give a name of your choice) and create the columns that are used to create the ticket. 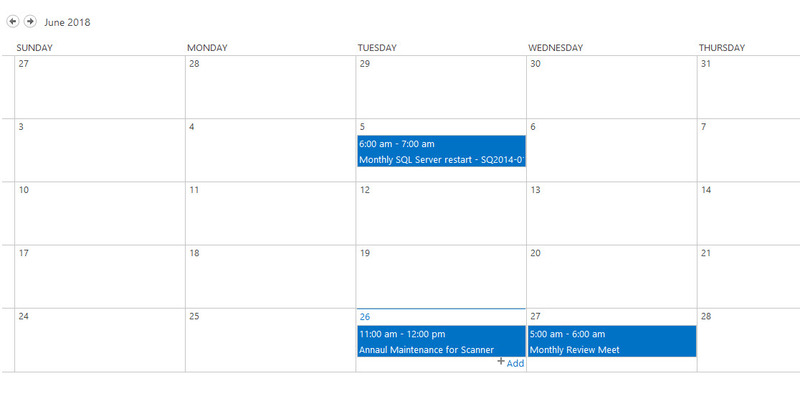 We can use the calendar recurrence option to set the recurrence schedule for this ticket. Please note that above columns are just representative and you can add whatever columns are required as per your use case of creating recurrence items. These columns need to be used in the Workflow later for mapping to the Ticket items that will get created as per the recurring schedule. In order to view upcoming recurrence tickets, please go to the Calendar list and check for the next month calendar view. How to implement Crow Canyon Ticketing System for different departments?